Having a smart thermostat controlling the temperature in your home can help to drastically reduce your energy bill each month. Many of these smart thermostats will learn your living habits and program themselves to provide heating or cooling. You can also manually program them to heat or cool your house at certain times on the day. If no one is home, it does not make sense to have your heat running. These thermostats are highly programmable and can be accessed over the internet through many devices. Let’s look at some of the best. The Ecobee3 is a smart thermostat that allows you to place sensors in any room of the house. It will provide the proper heat or cooling depending on the occupancy of the room and the weather outside. The thermostat and sensors will also know if anyone is home and reduce the heat or cooling. This can save on your energy bill each month. This system is a great way to create a modern and efficient home. This system is very easy to assemble and comes with quick setup guide. They also have many easy to follow videos on their website and on You Tube that provide detailed instructions for installation. Most thermostats only sense temperatures from the hallway or the room in which they are located. This does not provide any benefit if you are not occupying that room. 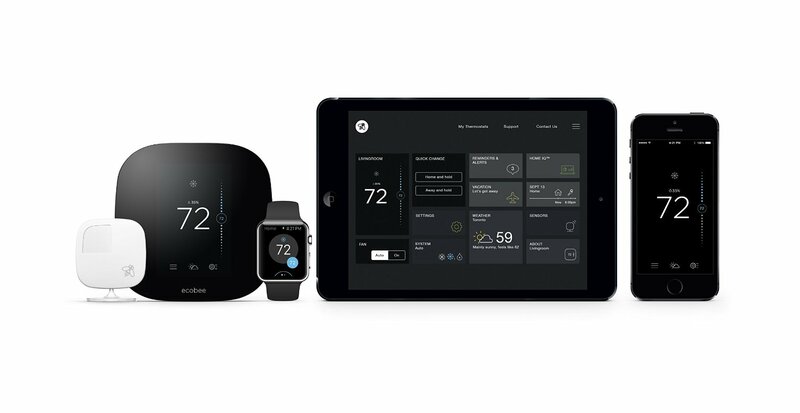 By placing the Ecobee3 senors around the rooms of your house, the system can accurately provide comfort to the rooms you are inhabiting. The sensors report temperature, occupancy and humidity in each location. Each sensor is battery operated. Each battery provided will last up to 4 years due to it’s low power consumption. The sensor will also alert you if the batteries are running low. You can pair up to 32 sensors with each thermostat. The more senors around the house the smarter the Ecobee3 becomes. The Ecobee3 can be controlled and programmed with your smartphone. It works with Apple and Android devices and platforms such as Apple HomeKit, Amazon Echo, Wink and SmartThings. The sensor and thermostat all communicate using wireless technology. Each sensor sends a wireless signal to the thermostat. The Ecobee3 is paired with your wireless internet router to provide communication and secure access when you are not at home. This will allow you to control your thermostat from any place that has internet access. Another cool feature the system allows for is the use and control of an external unit like a humidifier or dehumidifier. You can hookup this accessory unit and allow the thermostat to run the device and regulate it’s efficiency. The Ecobee3 collects data of your energy consumption and displays reports in charts and graphs. It provides highly accurate stats on just about all aspects of your household energy and behavior. The web portal gives detailed reports on when your system turns on and off, as well as when occupancy is detected in your various rooms. There are also reports on relative efficiency of your home. The Nest is another nice smart thermostat. This thermostat will also learn your behavior through sensors built into the thermostat. It lights up when you walk into the room. It can tell if someone is home or away and shape the heating and cooling needs based on your living patterns. This smart thermostat will help you save on your energy cost by regulating your environment. Setting up the Nest is super easy. Every thing you need to install the Nest is right in the box, including wall plate, screws and screwdriver. It’s just a matter of plugging in a few wires and mounting it where your old thermostat was. One cool feature is the auto-schedule. The Nest will learn your thermostat behavior every time you turn up or down the heat. It will then shape your comfort around your behavior. The Nest also works with your smart phone. You can control your Nest over cellular data or internet connection. Another great feature is you can turn up the heat before you come home. The Nest will collect data and send you monthly reports on your energy usage. It will give you detailed information on your energy consumption and behavior. This will help you see where you can make changes to save more money. 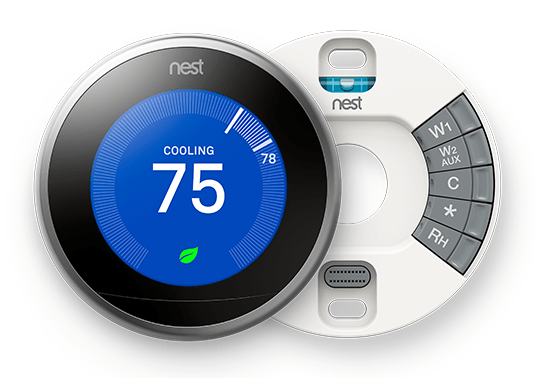 The Nest is involved in may rebate programs. In some cases you can receive a $100.00 rebate from your gas company. You can find out if you qualify at their website. The Nest is also offered for free with some security system purchases. The Nest also works and integrates with other smart devices. It will work in conjunction with Nest cameras and Nest carbon monoxide detectors to keep your house safe. For example, if a detector senses carbon monoxide it will shut off your furnace. The thermostat will also sense if you are away and turn on your security camera. Here is a list of all the devices that are compatible with the Nest. Need help installing your thermostat? 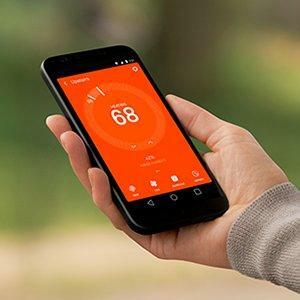 Hire a thermostat installer in your area from Amazon Home Services. Both of these smart thermostats will help you reduce your energy consumption. It is a nice and efficient way to stay on top of your energy use. These thermostats are a good way to upgrade your house with the latest technology. It is also an easy way to make your home a smart home and integrate all of your devices.